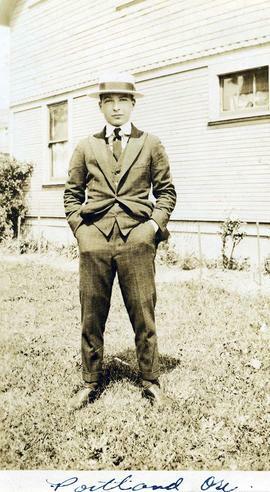 B&W print depicts a young Irving Snider posing for the camera with both of his hands in his pockets. "Portland Ore." is written along the bottom of the image.Note: colour adjusted on jpg. B&W print depicts an unknown young man sitting on a roof. "Portland, Ore." is written along the bottom of the image. 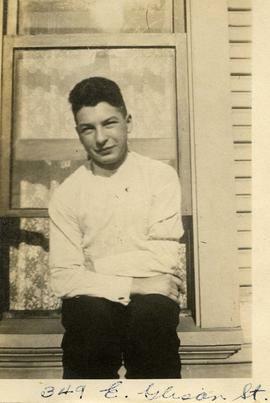 B&W print depicts a young Irving Snider, wearing a shirt and tie, sitting on a roof posing for the camera. "Portland, Ore" is written on the bottom of the image. B&W print depicts two unknown teenage boys sitting on a roof posing for the camera. "Portland, Ore." is written on the bottom centre of the image. B&W print depicts a young Irving Snider sitting on a roof posing for the camera. "Portland, Ore" is written on the bottom of the image. B&W print depicts an unknown young man posing for the camera with one of his hands in his pocket. There are houses in the background. "Portland, Ore." is written along the bottom of the image.Note: colour adjusted on jpg. B&W print depicts a group of dentistry students holding up a cadaver. B&W print depicts a group of dentistry students, including Irving Snider in the centre, holding up a cadaver. The number 2 was written on the border of the image that has been cropped off. B&W print depicts a group of dentistry students, including Irving Snider in the centre, posing around a cadaver.